Automotive Engine Component Assembly | Invotec, Inc. Engineered and installed a new semi-automated machine to assemble pins to a rubber valve, utilizing minimal operator interaction while maximizing quality and throughput on a thoughtfully designed no-tool change-over platform. Our customer was swamped with new orders and frustrated by trying to find someone to engineer, build and install a new semi-automated machine to assemble and crimp pins onto a rubber valve. This machine needed to maximize quality and throughput on a thoughtfully designed no-tool changeover platform with minimal operator interaction. 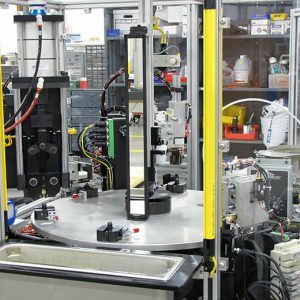 This automotive manufacturer, wishing to take control of one of their component assemblies, needed a semi-automatic machine to replace an offsite manual operation that was experiencing quality issues and low yield. The automotive engine component assemblies were not being produced in a reliable, efficient manner. A robust system was needed within the constraints of a tight budget and short schedule. 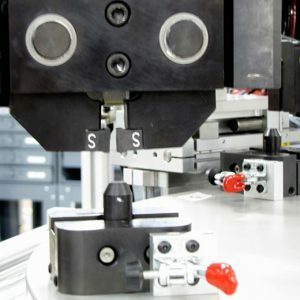 INVOTEC collaborated with the customer to derive a solution that provided easy changeover and poke-yoke capability to detect four different component configurations and numerous failure modes. The resulting design was a 6’ x 6’ dial assembly machine that utilized the six-position cam indexer with multi-function tooling nests that required no tools for changeover for different products. Vibratory bowl-feeding and blowfeeding of small sub-components accommodated the spatial constraint of the specified machine footprint. Two sets of light curtains protected the operator from the indexing dial, as well as from adjacent machine operations, allowing for rapid manual loading of components. Automatic crimping, gauging and unloading completed the automated process in a cycle time that was faster than specified. Overall, this project exceeded the specified requirements and provided the customer with a robust machine that netted a greater yield and improved quality over the manual operation it was replacing. Most importantly to the customer, they were able to offload the responsibility of this complex, turnkey system to INVOTEC and successfully focus on satisfying their customer.